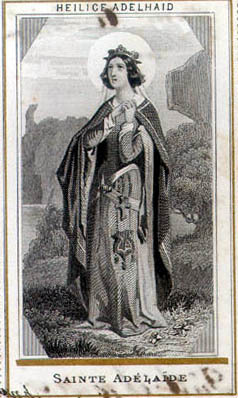 Saint Adelaide of Italy, some say she was the most prominent European woman of the 10th century. The daughter of Rudolf II of Burgundy and Bertha of Swabia. She was married at the age of 15, to the son of her father's rival in Italy, Lothair II, the King of Italy; the union was a political settlement designed to conclude a peace between her father and Hugh of Provence, the father of Lothair. They had a daughter, named Emma of Italy.The Calendar of Saints states that her first husband was poisoned by, his successor, Berengar of Ivrea, who attempted to strengthen his political power by forcing her to marry his son, Adalbert; when she refused and fled, she was found and imprisoned for four months at Como. She escaped to the protection, at Canossa, of Adalbert Atto, where she was besieged by Berengar. She sent an emissary to throw herself on the mercy of Otto the Great of Germany. His brothers were equally willing to save the heiress of Italy. Otto got an army into the field: they met at the old Lombard capital of Pavia and were married in 951; he was crowned Emperor in Rome, 2.2.962 by Pope John XII and, most unusually, she was crowned Empress at the same ceremony. Four of their children lived to maturity: Henry, born in 952; Bruno, born 953; Matilda, Abbess of Quedlinburg, born about 954; and Otto II, later Holy Roman Emperor, born 955. Her husband Otto I died in 973 he was succeeded by their son Otto II, and Adelaide for some years exercised a powerful influence at court. Later, her daughter-in-law, the Byzantine princess Theophano, turned her husband Otto II against his mother, and she was forced from court in 978; she lived partly in Italy, and partly with her brother Conrad, king of Burgundy, who helped her reconcile to her son; in 983 Otto appointed her his viceroy in Italy. Otto died the same year, and although both mother and grandmother were appointed as co-regents for the child-king, Otto III, Theophano drove her to abdicate and exiled her. Theophano died in 991, she was restored to the regency of her grandson, assisted by Willigis, bishop of Mainz. In 995 Otto III came of age, and Adelaide devoted herself exclusively to works of charity, restoring religious houses. She retired to a monastery she had founded in c. 991 at Selz in Alsace. She never became a nun, she spent the rest of her days there in prayer. On travelling to Burgundy to support her nephew Rudolf III against a rebellion, she died at Selz Abbey on December 16, 999, days short of the millennium she thought would bring the Second Coming of Christ. She had devoted herself and was a guardian to the service of the church and peace. Her feast day, December 16, is still kept in many German dioceses. Attributes empress dispensing alms and food to the poor, often beside a ship.